Music featured in the 80s comedy The Blues Brothers has won a BBC 6Music poll to find the best movie soundtrack. It beat the soundtrack to Quentin Tarantino's 1994 film Pulp Fiction, which featured Dusty Springfield, Al Green and Urge Overkill. In third place was the soundtrack to British film Trainspotting. The poll was run on the station's drivetime show, hosted by Andrew Collins. The Blues Brothers took 19% of the vote, only one per cent more than Pulp Fiction. 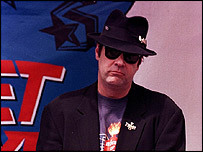 Collins said: "The Blues Brothers crosses age barriers, with its timeless mix of blues and soul. "It's a Sound Of Music for hipsters, a film that lives and breathes music," he said. "In effect scoring his work from his own record collection, was crucial to the way the film is received and remembered," said Collins of Tarantino's Pulp Fiction soundtrack. The fourth most popular film soundtrack was for the seminal 1977 disco film Saturday Night Fever, which featured several classic songs from The Bee Gees. In fifth place was for 1987's Dirty Dancing, which boasted the hit I've Had the Time of my Life by Bill Medley and Jennifer Warnes.